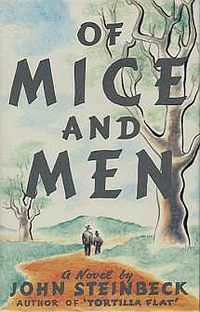 It was a pleasure to reread one of my first favorite classics from young childhood, Of Mice and Men. Everyone knows this one, so there's not much to say about its legendary status. The story takes place over three days during the Depression in Salinas Valley, California, where simple-minded giant Lenny Small walks down a dusty path with his friend and protector George Milton. They are headed towards a ranch to become barley bucks, which should be an easy job to land, as long as George does all the talking for his buddy who got "kicked in the head by a horse when he was a kid. He's alright. Just ain't bright." Curley, the rancher's son and a former boxer who likes to intimidate the hired help, chooses the wrong person in Lenny to pick on. Lenny pummels him, breaking every bone in Curley's hand. Next, Lenny accidently kills a little puppy who he loves too much and accidently mauls. He then accidentally does the same to Curley's wife, breaking her neck in the barn while a game of horseshoes goes on outside. Lenny runs away and a manhunt ensues. Luckily, George finds him before anyone else does. Knowing he has no other choice, George, for one last time, recounts the story of how they would work hard and someday own a farm together, before he points a gun at Lenny's head and kills him, knowing they would never escape Curley's hatred. This short novel is so classic because it epitomizes the everyday heroes of the time, many of whom had nowhere to go but tragically downward as they pursued the raw and elusive promise of America.